I can't stop looking at this photo. And it's not just because of her knees (those knees tho) or her cute ears (forward!). It's because I can't stop marveling at the progress we've made at Westhaven Farm since joining at the end of May 2015. One year! I remember my first lesson with Diane- I was running late due to Memorial weekend traffic and I was so nervous I kept calling her ma'am. Ellie and I were not getting along. 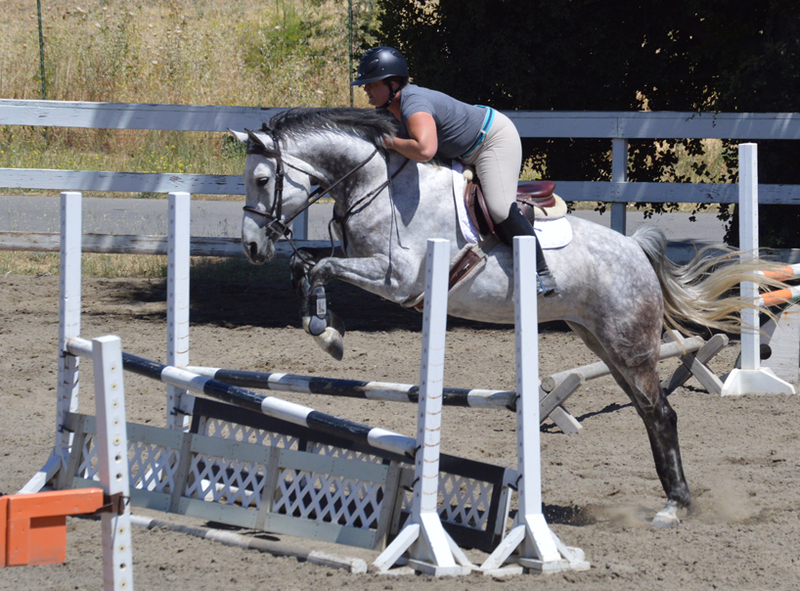 She was busy doing a hop step that I mistook for lameness- which magically went away when Ali rode. I couldn't make it over a crossrail without dissolving into a bundle of nerves- I would often occasionally cry tears of frustration and fear. Yet here we are a year later zooming around courses, and in the case of the below, jumping a three stride line oxer first. Feeling confident, braver, and strong. I trust Ellie, and I trust Diane and Ali to push me to meet my ability, despite my hesitance. And I'm just really proud, because this picture looks like a horse and rider team. You guys look absolutely amazing, congratulations on all of your progress! You girls look beautiful, what a great accomplishment! You both look great in this picture! Way to go! You should be proud! I'm so happy for you. You guys look like such a great team! I like all the shades of gray happening in this picture, super pretty! Great photo!!! You both look like you are having a lot of fun! You both look fantastic, and the change and improvement in you both is amazing! Such a good feeling! You both look great! Love this! As always your horse is gorgeous! You both look great!